Hello Fresh is affordable, flexible, vegetarian-friendly, allergen-friendly meal kit delivery service that offers delicious meals that will suit your dietary needs. It allows you to cook fantastic meals in no time while staying on the budget. Freshly is a budget-friendly meal delivery service that offers all natural, healthy foods free of sugars and gluten. It provides a diverse menu, time-saving recipes and great flexibility for all cooking skill levels. Offers 3-4 meals per one week for 2 or 4 people. Perfect for 2 or 4 people with a choice of 3 recipes per one week. Offers 2 to 3 meals per one week for 4 people. 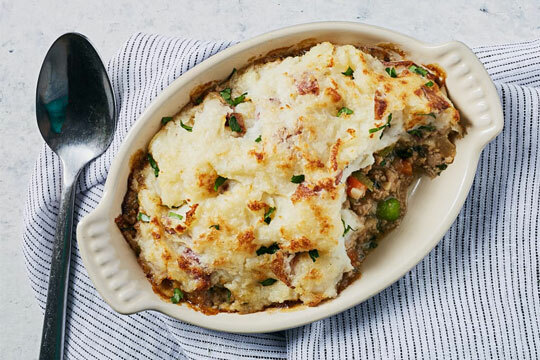 With Hello Fresh you will be able to choose from 3 different meal plans the Classic, Veggie and Family Plan. There are 3 excellent meals in the Veggie Plan, 6 in the Family Plan, and 12 fantastic dishes in the Classic Plan. The best thing about this company is that it gives you the opportunity to change plans from week to week according to your preferences. You could also check the weekly recipes in each program and choose the ones you want to receive in your delivery box. This meal kit service manages to redeem itself a little by offering a selection of great wines to accompany their dishes. They have a program that will provide clients with monthly wine subscription, read more about it here. Freshly offers four meal programs (4, 6, 9 and 12 meals per week) to choose from, which includes all-natural ingredients, free from refined sugars, gluten, and artificial additives. Their weekly changing eating plan selection has more than 30 meals that consist of both breakfast and entree dishes. You will get all the nutritional information about the ingredients on the package. Both Freshly and Hello Fresh offer very diverse menus with an excellent deal of choice when it comes to ingredients used, style of cooking and flavor influences. We have tried many meals from both of these companies so that we could be able to review and compare them. Hello Fresh is more focused on providing their clients with choices that are both delicious and classic. Their dishes have a lot of fresh vegetables, and they offer unusual recipes that you will surely like. Each of these meals includes some unique flavor and ingredients combinations that we liked. The company also makes dishes that are very family friendly. They are very focused on helping their clients to eat more plant-based ingredients, as you may already notice. The vegetables and fruits are always high quality, even though they are not always organic. Their poultry and pork is always hormone and antibiotic free, their meals are sourced domestically, and seafood sustainably. On the other hand, Freshly is a non-frozen, fully prepared meal service that is all about time-saving and convenience. The great thing about their dishes is the fact they take five minutes to heat. But we have to admit that some of their meals, didn’t quite match our taste, but overall we enjoyed most of the food. As for the quality, this company is very proud of their gluten-free certified status. They also assure their customers that the ingredients have no hydrogenated oils, refined sugars or preservatives. If you ask us, these are great news for the users who have some dietary restrictions. Both of the companies provide fresh and healthy ingredients to their clients. To learn more about the nutritional value of the meals and where they buy ingredients, all you have to do is read on. 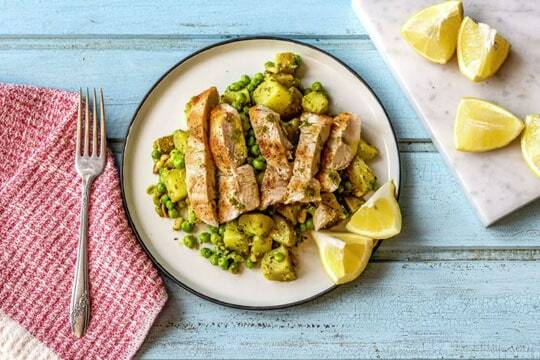 Hello Fresh touts simple and healthy meals, and it undoubtedly deserves its popularity. It offers ample-sized, well-flavored portions that are very easy to prepare and has a vast delivery area (US, Canada, some parts of Europe). They provide nut-free, dairy-free, and gluten-free dishes, as well as the nutritional information (sodium, cholesterol, protein, fiber, sugar, carbs, saturated fat, and calories) and the instruction cards for every meal. The company purchases their ingredients from several different suppliers, so nutrition facts per dish can vary from site to your package. The most impressive thing about Freshly is that their meals are very healthy – they are low in carbs, high in protein, gluten-free, and contain no processed sugars. Their meals are a single serving and meant to feed one person. But, we felt satisfied and full after each meal and didn’t feel like we need to add another side dish or salad. However, if you are looking for specific recipes that will meet your dietary needs, you can sort your order based on specific nutritional values. Some of our readers reported high sodium content, but we’ve noticed no such issues during our testing period. The Classic plan – This plan comes with simple fish and meat recipes. There are around six unique recipes to choose from. The Veggie plan – Choosing this plan allows vegetarian subscribers to select three different recipes each week. The Family plan – The goal of this plan is delivering kid-friendly meals. There are three recipes here, and their purpose is to serve two children and two adults. Hello Fresh food is tasty, nutritious, and widely varied, incorporating different cuisines from all over the world, including Korean, Asian, Italian, Fusion, Greek and many more. However, there are no specific accommodations for allergies, but at least the ingredients come sealed in separate packets. Hello Fresh dishes include all meats and vegetables that the user might need, the subscriber only has to provide a couple of seasonings, such as pepper, salt, sugar, and similar things. Picking the meal plan – The user’s choices are 4, 6, 9, and 12 meals per week. We went with nine weekly meals and tried to get three seafood, three chicken, and three “other” (pork, beef, etc.) entrees. Shifting up the primary protein is guaranteed to provide you with some variety during the week. Picking the delivery date – The company delivers throughout the week. The first delivery takes place on the chosen day of the following week. We decided to have our meals delivered on Fridays, and they always arrived between noon and three o’ clock in the afternoon. In case the subscriber isn’t at home when the kit is delivered, the box will be kept for the additional 12 hours. Choosing your meal – There are 26 entrees and five breakfasts to choose from, and new meals are introduced every few weeks. However, we have to say that these “new” meals are often the already existing ones but with just a couple of minor changes. The key to a great meal delivery is in good organization and convenience. This company packs its food in special boxes that contain enough ice to keep the ingredients at the right temperature. Hello Fresh shipping is free. The deliveries are available Wednesday to Friday from 8 AM to 8 PM. It delivers fresh food in 48 states. It doesn’t deliver to Hawaii and Alaska. This meal kit delivery uses northbox insulated packaging which is made of 100% recycled materials. Receiving your Freshly meal package is a breeze.This company delivers non-frozen, fresh meals on a weekly basis to your doorstep. It delivers food in 27 different states, and the shipping is also free. 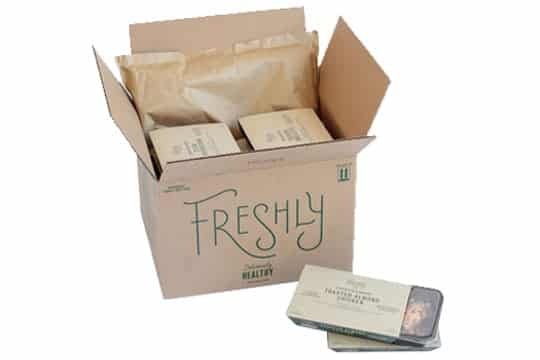 Freshly provides packaging that is made of recycled materials which is excellent news for all those conscious individuals. Switching plans – You can easily switch plans (Family, Veggie, Classice), the serving sizes, and the number of meals received per week. Cancellation – You can cancel or skip a delivery week. Just make sure to cancel/pause by 11:59 PM PST five days before your next scheduled delivery. Any cancellation after this cut-off date won’t be processed. Refunds – You can reach out to the customer service within the first five days if you are unhappy with any part of your Meal Box. The company will give you credit for that ingredient, or in some situations, issue a full or partial refund for it. Gift – You may receive or/and purchase Gift Cards through the App or their site. They are not redeemable for credit or cash, except the extent that the applicable law requires. Free Trial – Hello Fresh may offer discounted/free trials, discount promotions, or another type of vouchers if you create an account through their app or site. Customizable – Both the app and website are user-friendly. You can do whatever you want to do regarding your account online and order. You can change your payment method, select your weekly recipes, change plans when needed, specify your dietary preferences, or register. Switching plans – Freshly offers their clients to change or switch their meal plans up for the next week. There is a deadline when a client can do that since the company needs five or six days to prepare and ship the food. Cancellation – You can’t cancel the service when it is already shipped. Refunds – You may receive a partial or full credit or refund if you are not satisfied with your delivery. You just have to report your complaints within five days of your delivery date. Gift – the Company doesn’t currently offer gift cards, but you can send a weekly subscription as a gift. Free Trial – Freshly doesn’t offer free trials since all of their meal plans and programs are set up as weekly recurring orders. Customizable – Freshly allows subscribers to actively choose which dishes they may want to avoid, which they want more of, and which recipes they like. We have enjoyed our experience with both Freshly and Hello Fresh. These companies offer services that are highly convenient and all about enjoyable dining experiences. But, if we need to choose the winner, we would pick Hello Fresh. Their options are more satisfying and delicious, even though you need to cook the meals as it is a meal kit service. But the great thing is that their dishes are filled with fresh ingredients and fantastic flavors. And what sets Hello Fresh apart from other meal delivery services is the variety of recipes you can choose from. Check out our Home Chef full review to discover what kind of recipes they are offering, how their service works, how much the food cost and whether is it the right choice for you.